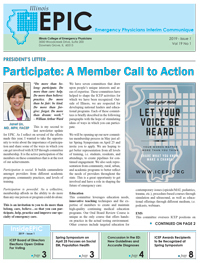 The Illinois EPIC is the bimonthly newsletter of the Illinois College of Emergency Physicians. ICEP reaches more than 1,300 emergency physicians in Illinois and 150 more emergency medicine leaders throughout the country. Every issue includes a letter from ICEP’s President, current chapter and clinical EM news articles, classified ads with open positions, a calendar of all of ICEP’s upcoming meetings, educational programs and events, and more. Interested in placing an ad in the Illinois EPIC newsletter?